My mom and I pre-planned arrangements for dad while he was in hospice. It was a comforting experience with no pressure. When dad passed it was nice to have arrangements in place and everything with regard to viewing and funeral service unfolded with dignity and ease. We appreciate the support of the staff and use of the beautiful facility. 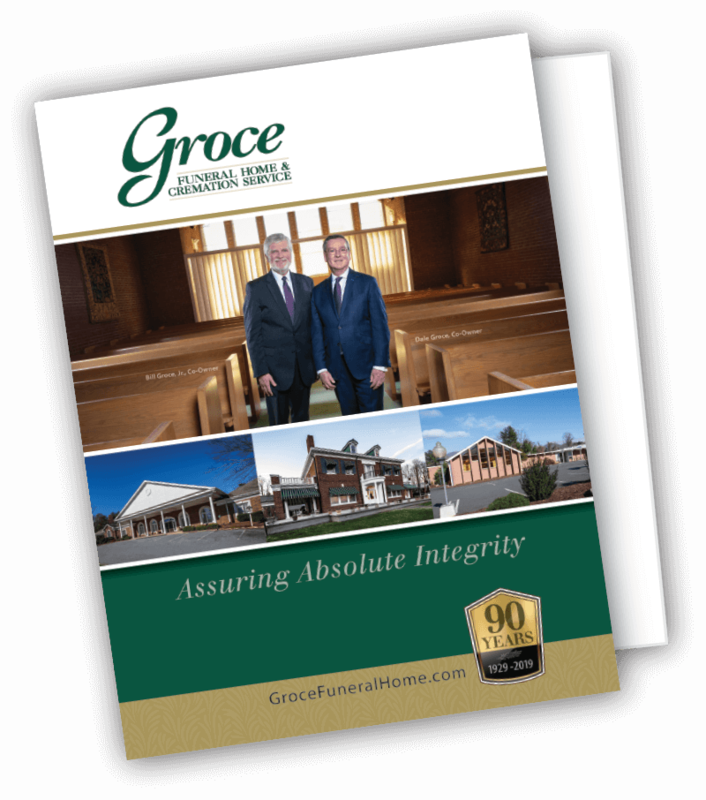 Our family greatly appreciates Groce Funeral Home. Many of our loved ones who’ve passed have been brought to your facility, dating as far back as the 1950s. Our love and gratitude to Groce and staff. I was very pleased with all the staff and services offered at Groce. I would highly recommend Groce Funeral Home. Very impressed that our request for simple service was honored. No sales pitch. It was easier than I expected. Dale Groce and the staff are #1. They are kind, caring, and respectful. I have complete faith and trust in Dale Groce. Bill Groce was very attentive to my every request for my mother’s service. Their staff is most respectful and professional. Even my mother’s hair was most expertly styled. Thank you. We have always used Groce for previous deaths in our family – service was excellent, you have a very caring staff – of all funeral homes we’ve attended, yours is outstanding. Mr. Scott Lynch handled the services for my mother and we could not have asked for a better man. He was kind and considerate and very helpful. He was very respectful and went out of his way to make sure things were right. He made our experience more than acceptable!! All needs were met, and suggestions were greatly appreciated. Groce Funeral Home has always been a blessing to my family. God bless each member of this organization. My family had used Groce many times and has always been pleased with your service. Greg Gillespie was wonderful to us and very helpful in every way. We are so appreciative and thankful to him personally and to Groce for your exceptional care. God bless! Our thanks and appreciation also to Anne in the office. All you folks were very nice, very concerned about our whole family, always willing to give us important information in detail. Never held back on giving us assistance. Thank you kindly. Groce is a family owned service and is active in the county and community affairs and is well-known and respected. Their service is personal and always dependable. I was very pleased with the comprehensiveness of your services. Bob Hembree was so helpful to all the family and we really appreciate all his efforts. Greg Gillespie was a great representative for Groce. He helped us navigate through the details of the funeral arrangements with compassion and skill. Very professional & friendly. Did an excellent job with appearance of our loved one. I would recommend this funeral home to everyone. Groce is a step above anyone else in town. The staff was great to work with, they made the experience an easy one, especially when they picked up my father at the nursing home. The driver showed upstanding respect to him and our family – we will use Groce again. My family and I were well pleased with your service, care and compassion. I normally don’t do surveys but I was very happy to do this one. I highly recommend GFH; Very understanding & patient.